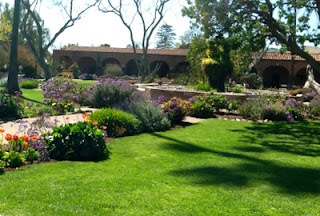 From the outside wall of the Mission San Juan Capistrano garden, the visitor already has the notion that this is a California garden. The white-stuccoed wall is topped with a thick and heavily blooming red trumpet vine and under planted with a variety of cacti, succulents and other dry garden plants. 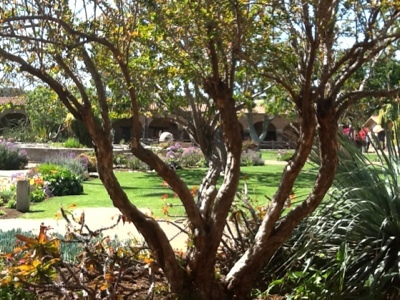 But for a brief second inside the walled garden, it is reminiscent of Greek ruins. The old Mission itself--the Great Stone Church-- is in ruins, heavily damaged by an earthquake in 1812 and not too much of it remains today. What does remain, the beautiful backdrop of white stone walls that are now 200 years old, heightens the sense of history surrounding this landmark and adds to the garden's mystique and romantic lure. It is the seventh of 21 Spanish Missions in California and was founded in 1776. 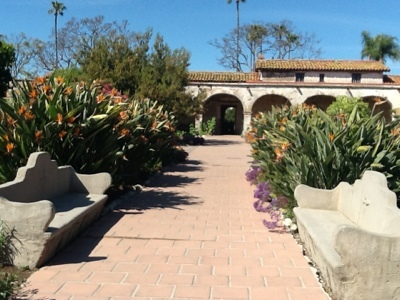 It is located south of Los Angeles in San Juan Capistrano, California. Candles glow inside a small, ornate chapel known as Father Serra's chapel, which is still intact and is considered the oldest building in California. Meanwhile, churchgoers attend mass at a newer basilica built in 1986 (indicated by the domes above). The central courtyard is anchored by a fountain complete with koi fish and lily pads. And the garden--on this, the second day of Spring--explodes with color. The color purple, mostly. and lavender, covered in blooms. are mixed with bright California poppies. A ceanothus matches the sky. Dense sprays of bougainvillea cascade over white walls. I even developed a crush on a shrubby paddle cactus with reddish buds. something unexpected in a Mission garden. The birds of paradise are impressive and also studded with blooms. Butterflies flutter seemingly everywhere with so many lovely blooms to choose from. Even the creeping fig is in excellent form here. The only thing missing are the legendary birds, the swallows, that migrate on their own mission from Argentina every Spring. They nest here and around San Juan Capistrano. The story goes that they arrive on March 19 and then return to Argentina in October. Both the Mission and the town celebrate their return with festivals. These mud nests (above) that the swallows built under the eaves must be from previous years, because there wasn't one swallow to be seen on March 21st. 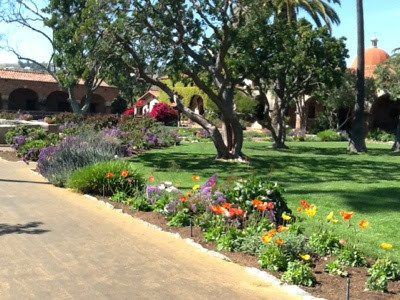 Even with a bird's eye view, this garden is simply a beauty to behold. Gorgeous, gorgeous pictures. I'm amazed that so much is already blooming! It looks like summer. I wonder where the swallows are. They need to check their datebook! Jeannine, I have heard about the mission before, but even though it is close to where I live, sadly I have never been there. The gardens look indeed quite well taken care off and I love the old buildings, even if they are partly only ruins. I am wondering, did they have planted any roses in the gardens? Thanks for featuring this mission in this post! Thanks for your visit. The mission is worth a trip. 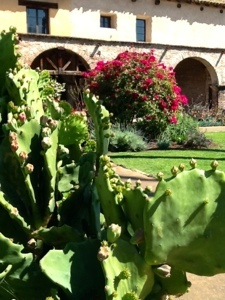 I believe I did see a few rose bushes in the smaller courtyard near the ruins of the Stone Church. Sounds like you and I share the same mission - although I don't get to visit such glamorous locations that often! Thanks for dropping by at ernie and i, and keep up the good work!